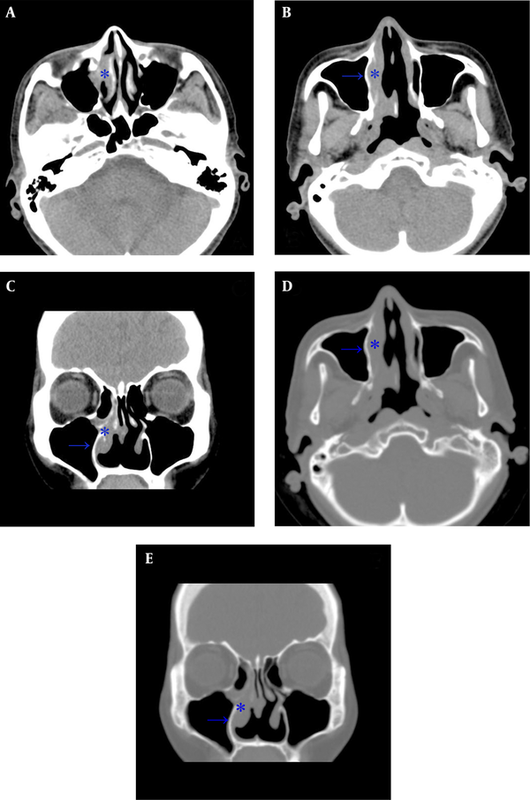 To Cite: Ni C, Chen L. Nasal-Type Extranodal Natural Killer/T-Cell Lymphoma Mimicking Recurrent Sinusitis: A Case Report and Review of the Literature, Iran J Radiol. 2017 ; 14(2):e33054. doi: 10.5812/iranjradiol.33054. Nasal-type extranodal natural killer (NK)/T-cell lymphoma (ENKTL) is a rare type of lymphoma that is endemic to East Asia. It typically demonstrates as a destructive mass involving the midline facial tissues that causes rhinosinusitis symptoms such as nasal obstruction, sinusitis, ulcer, and epistaxis. The diagnostic tendency of nasal-type ENKTL is to use computed tomography (CT), but this may present infiltrative patterns without a prominent mass, making it difficult to distinguish ENKTL from benign inflammatory diseases. Here, we report a 59-year-old male with a chief complaint of rhinosinusitis symptoms, mimicking chronic sinusitis and a CT scan showing a typical right sinusitis pattern. Functional endoscopic sinus surgery was performed and a positive culture was consistent with the diagnosis. However, histopathological and immunohistochemical evaluation established the diagnosis of nasal type ENKTL. Follow-up positron emission tomography-computed tomography (PET-CT) also corresponded with this diagnosis, and therefore, radiotherapy and chemotherapy were indicated. Nasal-type extranodal natural killer (NK)/T-cell lymphoma (ENKTL) is a rare entity, typically involving the nasal cavity, palate, or midfacial region. It is more endemic in Asia and central and South America than in industrialized Western populations (1). The characteristic geographical distribution suggests that distinctive racial patterns may imply the responsibility of genetic factors to some extent (2), but also that it is closely associated with a high incidence of infection by epstein barr virus (EBV). In the world health organization classification, NK cell lymphomas are classified into two subtypes: ENKTL and aggressive NK cell leukemia. Clinically, NK cell lymphomas can be classified into three categories: nasal, non-nasal, and aggressive lymphoma/leukemia subtypes (3). Nasal-type ENKTLs are locally malignant, with only approximately 10% of patients experiencing distant organ involvement. The international prognostic index suggests that nearly 80% of nasal-type ENKTL cases are in a low-risk group, although some patients in this group have a poor prognosis. Therefore, additional studies are attempting to discover novel prognostic markers or another index to better stratify patients with nasal-type ENKTL based on risk (4). Patients with nasal-type ENKTL suffer from non-specific rhinitis but relative refractory and mass-related symptomatology such as nasal obstruction and epistaxis. The more specific symptoms and signs include facial swelling and oronasal defects related to the development of deep necrotic ulceration in the midline of the palate (5). It is generally thought that the computed tomography (CT) features of nasal-type ENKTL are contrast enhancement, bone erosion, and adjacent soft tissue extension. But a non-enhanced, homogenous, unilateral, and infiltrative pattern, without central necrosis, is more common. If no prominent mass is noted, some studies suggest the presence of nasal cavity mucosal thickening alone, without sinus wall thickening, may be a useful indicator of nasal-type ENKTL (6). A 59-year-old male had a history of nasal septal deviation and chronic hypertrophic rhinitis status post-septoturbinoplasty with septal perforation. He suffered from postnasal drip for years. According to the patient, nasal obstruction and purulent rhinorrhea were also noted. Neither hyposmia nor headache was found. For these reasons, he referred to the otorhinolaryngology outpatient department. The patient’s complete blood count showed a normal profile: WBC (6700 cells/uL) with normal differential count, MCV (89.3 fl), MCH (30 pg), MCHC (33.6%), and absolute neutrophil count 4190 cells/uL. Non-enhanced sinus computed tomography (CT) was arranged under the impression of chronic sinusitis, which showed typical chronic rhinosinusitis manifestations such as mucosal thickening with mucus retention in the right middle meatus (Figure 1). The patient was admitted for functional endoscopic sinus surgery (FESS), which presented polypoid change at the middle meatus and maxillary sinus. The bacterial culture of the specimen showed Pseudomonas aeruginosa, and the patient was discharged on the next day after the procedure with a stable status. However, the histopathological and immunohistochemical evaluation showed that the middle meatus mucosa had marked extensive and diffuse atypical proliferation of a monotonous population of small to intermediate-sized lymphoid cells, which were reactive against the CD3, CD45RO, TIA-1, and CD56 (NK cell) antibodies and not reactive against the CD20 antibody. In situ hybridization for EBV-encoded mRNA (EBER) was positive in most tumor cells, which established the diagnosis of nasal-type ENKTL (Figure 2A - B). Follow-up positron emission tomography-computed tomography (PET-CT) revealed significant uptake at the right nasal cavity compatible with tumor lesion, without definite lymph node invasion or distant metastasis (Figure 2C, D). He was transferred to the outpatient department of radiation oncology and chemotherapy and radiotherapy prescribed for him. Figure 1. Computed tomography (CT) scan of the paranasal sinuses in a 59-year-old man with history of septoturbinoplasty, chronic postnasal drip, nasal obstruction and purulent rhinorrhea. A, Axial plane shows mucosal thickening at the right middle meatus (star) consistent with sinusitis; B, Opacified right nasal cavity with thickening mucosa and relative thickening of the medial maxillary sinus wall (arrow) compared to the left side; C, Coronal plane shows right sinusitis; D, Axial plane at bone window showing the corresponding thickening change of the medial maxillary sinus wall; E, Coronal plane at bone window. Figure 2. FESS material of the right nasal cavity. A, Hematoxylin-eosin stain (× 400) showing marked extensive and diffuse atypical proliferation of a monotonous population of small to intermediate-sized lymphoid cells containing angulated nuclei. No tangible macrophages could be found; B, Immunohistochemical study showed that the tumor cells were reactive against CD56 (NK cell) antibodies and were also reactive against CD3, CD45RO, TIA-1 and CD56 (NK cell) antibodies (not shown). In situ hybridization for EBV-encoded mRNA (EBER) was positive in most tumor cells (not shown). FDG-PET study of the whole body was done: C, Hypermetabolic foci (maxSUV:8.4, delayed SUV:9.1) in the right nasal cavity, compatible with the biopsy proven nasal-type ENKTL invasion. Note mucus collection with very faint FDG uptake in the right maxillary sinus was likely due to sinusitis; D, Multiple symmetric foci with increased FDG uptake in bilateral supraclavicular fossa was due to physiologic uptake of brown adipose tissue. Nasal-type ENKTL is a rare type of lymphoma that is endemic to East Asia and parts of central and South America. The male-female ratio is approximately 3: 1, and disease occurrence peaks in the fifth decade of life. It is the most common histologic subtype of nasal lymphomas in Asian patients (1). The differential diagnoses of nasal-type ENKTL include cocaine abuse, trauma, infection, inflammatory disease, and other neoplastic processes. Initial diagnostic studies may aid in the delineation of this disease process through the elimination of other diagnoses (7). For example, nasal obstruction, refractory sinusitis, ulcer, and epistaxis due to a destructive mass involving the midline facial tissues hint at nasal lymphoma. Laboratory evaluation may demonstrate an elevated white blood cell count and positive culture result secondary to concomitant sinusitis. CT and magnetic resonance imaging (MRI) may reveal an extensive soft tissue mass obliterating the nasal passages and surrounding sinuses with additional involvement and erosion of adjacent alveolar bone, hard palate, or orbits (8). While these are not specific, some clues help us to distinguish the tumor from other benign disease. First, in patients with persistent symptoms of sinusitis despite ‘adequate’ treatment, a high index of suspicion should be exercised for more sinister conditions. Second, apart from refractory sinusitis symptoms, these patients also had the red-flag B symptoms of fever and weight loss (9). Third, CT scan may notice contrast enhancement, bone erosion, and adjacent soft tissue extension. If no prominent mass is noted, such as an infiltrative pattern, the presence of nasal cavity mucosal thickening alone without sinus wall thickening may indicate nasal-type ENKTL, which is differentiated from chronic rhinosinusitis in that it shows both nasal cavity mucosal and sinus wall thickening (6). Our case demonstrates nasal-type ENKTL symptoms can be superimposed by chronic sinusitis symptoms. This case has refractory sinusitis symptoms, but this is reasonable because of the patient’s history with nasal septal deviation and chronic hypertrophic rhinitis status post-septoturbinoplasty with septal perforation and positive culture result. Another challenge is that prior chronic hypertrophic rhinitis results in nasal cavity mucosal thickening with sinus wall thickening, which obscures the natural presentation of nasal-type ENKTL. In our opinion, the most important perspective is that the positive culture result decreases the possibility of nasal-type ENKTL. Surgical procedures such as FESS, turbinectomy, or the Caldwell-Luc procedure are useful for harvesting adequate biopsy specimens for the pathological examination of sinonasal lymphoma (10). However, some authors suggest that routine histopathological examination of FESS material has little clinical value and question if this procedure should be performed (11). In this case, routine histopathological examination of FESS material helped to avoid missing the diagnosis. It is suggested that routine histopathological examination of FESS material may be adapted to Asian patients because of the relatively higher prevalence of nasal tumor. The optimal treatment modality of nasal-type ENKTL has not yet been clearly established, as it is an extremely rare entity. Currently, the recommended treatment modality for nasal-type ENKTL is the combination of anthracycline-based CHOP (cyclophosphamide, doxorubicin hydrochloride, vincristine sulfate, and prednisone) chemotherapy with local radiotherapy, which has been demonstrated to slow local progression in early-stage disease (12). This patient underwent the recommended treatment modality: a combination of anthracycline-based CHOP chemotherapy with local radiotherapy. There is still no perfect parameter to monitor treatment efficacy and disease progression. For example, the international prognostic index (IPI) is widely used but often underestimates the severity of nasal-type ENKTL (13). Measuring circulating EBV DNA in the peripheral blood is a simple way to help make a differential diagnosis, monitor treatment efficacy, and follow the disease progression. Nasal lymphomas of T-cell or B-cell origin have only a weak association with EBV, which further strengthens the argument for the etiological role of EBV in NK-cell tumors. 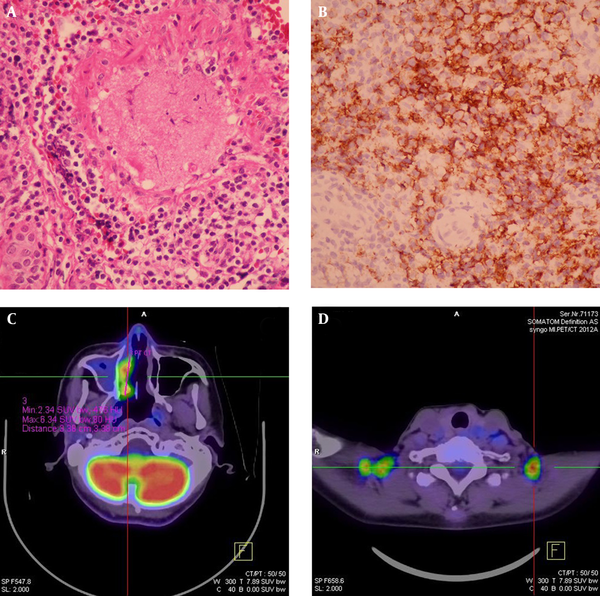 Wegener granulomatosis is EBV negative, while lymphomatoid granulomatosis is EBV positive (14). The disease activity and tumor volume can also be monitored by measuring the amount of circulating EBV DNA, as a high titer is correlated with extensive disease, unfavorable response to therapy, and poor survival (15). Other parameters have been reported to correlate with the prognosis and new staging systems. The absolute monocyte count (AMC)/absolute lymphocyte count (ALC) prognostic index, incorporating variables associated with the tumor microenvironment and host immunity, may offer a better risk stratification for patients with nasal-type ENKTL when superimposed on the IPI, and the baseline monocyte count is helpful in determining the prognosis in nasal-type ENKTL patients (4). Nasal-type ENKTL is a rare and aggressive disease but is the most common histologic subtype of nasal lymphomas in Asian patients and accounts for most (70%) of the ENKTLs in Taiwan (16). Most (80 - 90%) patients present with nasal obstruction, sinusitis, ulcer, and epistaxis due to a destructive mass involving the midline facial tissues. Other patients with an infiltrative pattern may have refractory chronic sinusitis or typical ‘B’ symptoms and nasal cavity mucosal thickening without sinus wall thickening in radiological features. These principles are inapplicable to this case, which demonstrated that the malignancy can be superimposed by benign inflammatory disease, which can be entirely supported by clinical presentation and radiological features. It is suggested that routine histopathological examination of FESS material may have little clinical value in Western countries, but further investigation is required to achieve a better understanding of the value of routine histopathological examination of FESS material outside of the Western countries. Thanks to Shin Kong Wu Ho-Su memorial hospital, Taipei, Taiwan. Authors’ Contribution: Study concept and design, Chang-Fu Ni; acquisition of data, Chang-Fu Ni; analysis and interpretation of data, Chang-Fu Ni; drafting of the manuscript, Chang-Fu Ni; critical revision of the manuscript for important intellectual content, Liang-Kung Chen; statistical analysis, Chang-Fu Ni; administrative, technical, and material support, Liang-Kung Chen; study supervision, Liang-Kung Chen. Financial Disclosure: There are no relevant financial interests to disclose.